Sparks Fly: 1 bed / 1 bath. Sleeps 4. You remember that moment. The moment you realized THEY were the one. That moment THEY made Sparks Fly and you’ve never looked back. At Sparks Fly, we have tried to capture and recreate that moment for you. 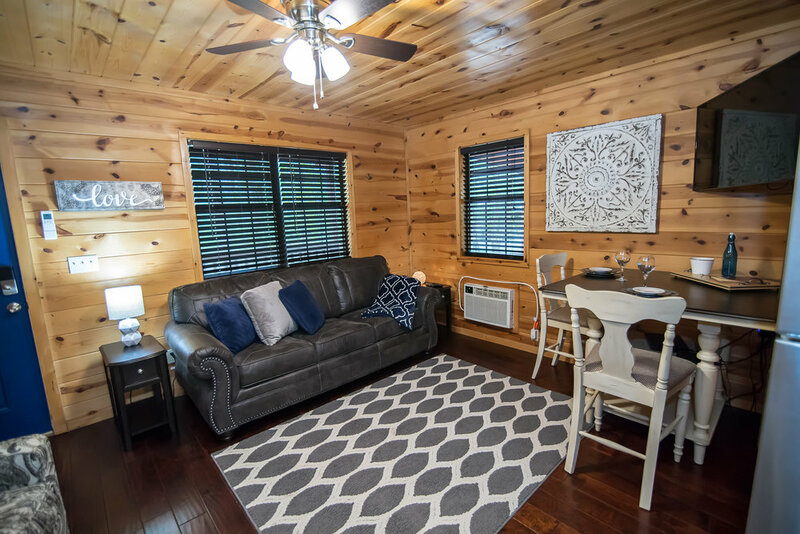 This cozy and romantic 1 bedroom cabin is designed to keep your special getaway as simple, clean, & comfortable as possible so you can focus on the important part of the trip, each other. 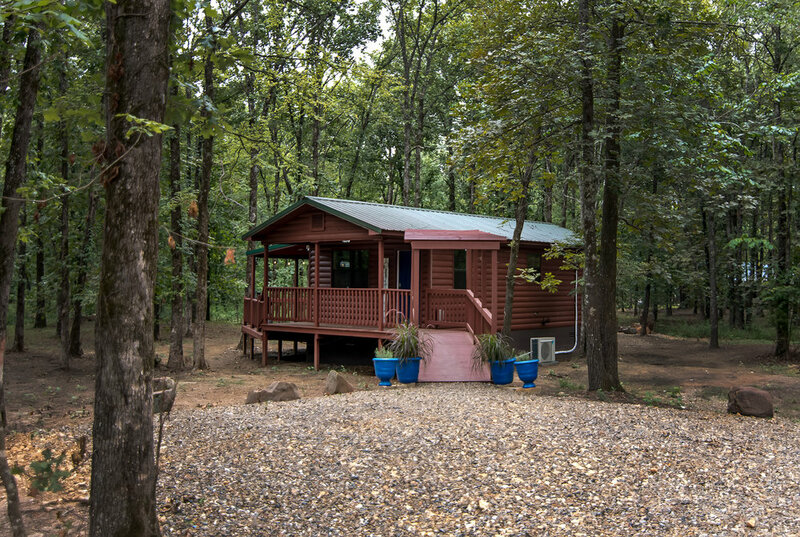 The cabin is outfitted with a ready to cook kitchen - cookware and dinnerware provided – comfortable furniture, large flat screen TV, and free WiFi. Even with all the comforts and amenities inside, you will continue to find yourself drawn out of the cabin. Sparks Fly is tucked into the trees on a large wooded lot off a quiet paved road. 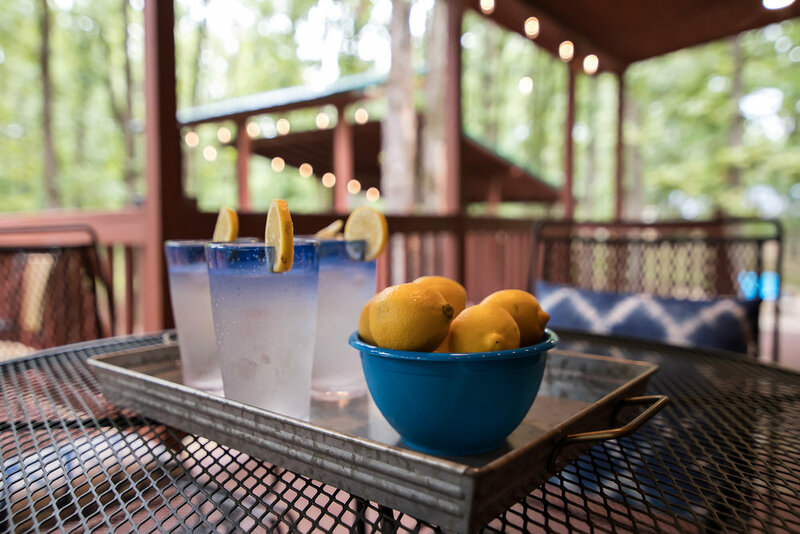 The spacious covered deck is the perfect hangout for dining outside, taking a quick nap, reading a book, or spending time with that special someone. The deck leads to a private hot tub gazebo where you can spend evenings relaxing. If you love a good campfire, and who doesn’t – then you will love the specially designed fire pit waiting for you at Sparks Fly. For those who are hoping to spend time exploring the area, you will love this location. Sparks Fly is within just a few minutes drive of the State Park, Broken Bow Lake, and adventures like zip lines, kayaks, and horseback rides. All the local dining, breweries, wineries and shopping are also close at hand. Whether your getaway is to celebrate fresh new shiny sparks, to feed a steady flame, or to uncover a smoldering ember that day to day life keeps kicking dirt over – we hope you find everything you need at Sparks Fly.